Clay George will be taking off his cowboy hat and donning his trilby for a session of Sinatra-style songs tonight (Thursday) at Governor's House in Phnom Penh. Accompanists Phil Javelle and Lewis Pragasam will be deploying their estimable musical skills in the usual octopus-like fashion: producing many layers of rhythm, melody, harmony and bass with just one keyboard, a set of drums and two pairs of hands! Clay's robust baritone is the hallmark of his three albums of folky, Nashville outlaw-style original songs. His vocal range and repertoire extend much further than that, however, when he sets down the six-string and takes the stage Vegas style: microphone in one hand, scotch-on-the-rocks in the other. Clay George will be breaking out 'New York, New York', 'The Lady is a Tramp' and many other smooth classics with Lewis & Phil tonight at Governor's. You can also see him perform with esteemed pianist Larry Martinez most Saturdays at Riverhouse Asian Bistro. Jahzad is a band name which has not been seen in the Leng Pleng Gig Guide for far too long! 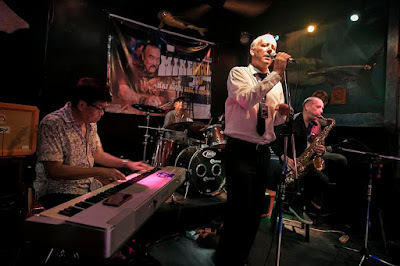 It has been one year since the sextet of ska-jazz fusionists last took to the Cambodian stage (at Doors Phnom Penh – a city venue that has itself been removed from the live music scene for a long while). Jahzad is one name that, like Durian or Grass Snake Union, guarantees an evening of celebration, dancing and wild abandon. 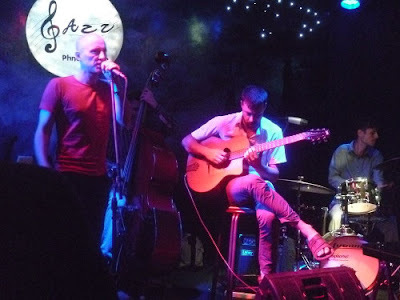 The other Phnom Penh party bands may, alas, be nowhere to be seen, but Jahzad are coming back this weekend – bigger and better than ever – for a brace of shows at the new Jazz Club Phnom Penh. Not content with having two of the hottest horn players in the country head up the band (Euan Gray, Alex Scarpati), the Jahzad sextet now becomes a septet with the addition of Norman King. Norman joins fellow Jazz Club regulars Seb Adnot (upright bass), Toma Willen (drums) and Larry Martinez (keys) in an awesome line-up of musicians that would grace any stage in the world. The band are directly inspired by the music of the Skatalites, which comprises of high-powered, jazz-inspired horn arrangements married to irresistible, high-tempo Jamaican rhythms. 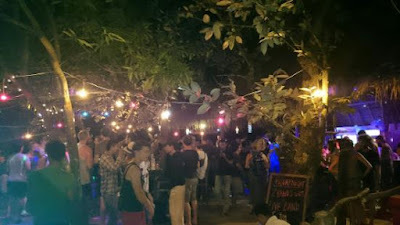 Jazz Club Phnom Penh will be turning up the sub-woofers and preparing for a Jahzad party this Friday and Saturday night. The owners of the Bassac Lanes bars have been staring the Cambodian rainy season in the face and shouting 'rock on!'. Live shows continue this Friday (the lane-ways may not be covered but the bandstand and the bars are rain-proof) with the new-look JADermeister. Singer Sarah Gee is making the transformation from shy-girl-with-an-acoustic-guitar to rocking frontwoman. The Phnom Penh music scene needs all the rocking venues (and all the rocking frontwomen) it can get at the moment – so Ted, Timothy and all the Leng Pleng team will be down at Bassac Lanes to cheer them on. If the weather is bad, we have prepared a kind-of New Zealand rugby team style, anti-raindance to get things going. Banyan Tree Kampot celebrates its first anniversary on Friday night. Owner Sok Chiet is the lead singer of Kampot Playboys, who have been gracing the Banyan Tree (as well as the Madi Bar) with their unique and lively Khmer-rock fusion on a regular basis over the past twelve months. Banyan Tree was born when Chiet took over ownership of the famous Bodhi Villa and expanded the premises with a larger bar, stage and dancefloor area. Bodhi Villa mainman Huge Monroe has gone on to rebuild the landmark Kampot Fishmarket on the other side of the river. Huge will be back to support Chiet and the Playboys on Friday with his rocking trio Mr Mammoth. DJ Moudy is also on side to guarantee a fantastic riverside party befitting such a great venue. Norwegian singer-songwriter Hilde Marie recently released the music video below for her track 'Traces'. The video was filmed by Oyen Rodriguez and the music was entirely recorded and produced at 60 Road Studios in Siem Reap. You will probably recognise many of the locations!